This piece is from the foreword Ann Voskamp wrote for Ken Shigematsu’s Survival Guide for the Soul. So, it kinda turns out? All the drowning people keep to-do lists. But the Soul Survivors keep rhythms. Every dawn is Day One. Today is made of fresh hope. Once, while I was reading to one of my daughters a story about a young woman who “put on her habit,” our little girl reached up and patted my shoulder. “What’s a habit?” she asked. I stopped for a moment, and then spoke slowly, carefully choosing my words. It was a “new dawn” moment for me, a fresh recognition of a familiar idea. A habit is something that is worn. A habit is what we wear. And a habit is the way we wear our days. If you consistently keep the same rhythms every day you will keep your soul from growing threadbare. Consistently keep the same soul rhythms every day, and you grow deeper into Him, the One who will reweave your soul into glory. Musicians play one right note after the next right note after the next right note. It’s not an erratic splattering of sound or a fickle, helter-skelter banging of random notes. Music has order. It is composed. The notes played are intentional, considered and deliberate. Lives that have rhythm sing. They don’t survive – they thrive. 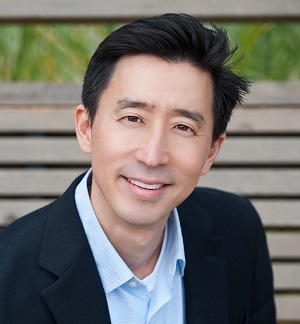 My daughter and I once sat at a table, a few blocks from the ocean, and enjoyed a long, lingering lunch with a man named Ken Shigematsu, who wrote a Soul Survivor’s guide who hands over this lifeline of how to do just that, how to form spiritual habits that pull you close to Christ, wear Christ, savour Christ, commune with Christ, and survive, thrive and rise in Christ. I light a candle every day at the prayer table. And I write a bit in my journal, not mere words of mine, but Words of His copied out on the page. It’s as if writing them with my own hand, shaping them with my own hand, can bring shape to my own life. Because? Only our own lack of love can keep us from His love letter. Only being captivated by other words can keep us from His Word. Keeping the rhythm of reading His Living Bread after every meal has been the singular most transformative habit of my life. Do we read more of His words than those on streams and screens? Do we intentionally practice habitual, unwavering gratitude — or do the circumstances of our days control and form the tone of our souls? Do the rhythms of our sacred friendships and daily vocations consistently and congruently look cruciform? And while our habits clothe us – they also unclothe us. Our habits expose our wounds, our insecurities, our idols, our addictions, our chaos. But they also reveal our hopes, our dreams, our prayers, our steady souls. Habits matter because habits are the spine of our self-control. Habits are the small gears that leverage your life – and if you change your rhythms, you can change anything into a possibility. You change your life when you change how you meet Christ every day. Our rhythms become our everyday liturgy, the sacred cadence of the hours that reorient our tired souls. Countless times I’ve watched my daughter sit before the white keys, her wrists arched, her fingers stretching into song. Each finger knows where to hit the next note. She hardly thinks about it. It’s nearly automatic, an unconscious action. So go our daily songs and rhythms of the soul, the essence of our habits. We play a note that becomes a subtle cue for another note to follow. We rise and pray. Or we check the internet. Or we go for a run. Day after day we practice and play our chosen series of notes, performing actions cued by other actions. Far too many of my days have felt a bit like – drowning. A flailing cacophony. It’s hard to hold on to the rhythm when life keeps crashing in on every side. When it’s hard to hold on, no one holds on to what is cool. They hold on to Christ. When it’s hard to hold on, no one holds on to what is hip. They hold on to Him who is holy and healing. When it’s hard to hold on, we don’t hold on to what’s trendy. We hold on to the True Vine. We don’t hold on to the prevailing and the popular, we hold on to the Prince of Peace, the true Perfecter of our Faith. We only rise because of the Gospel – the astonishing news that grace has grabbed the unworthy, and Christ cleans the unbearable, and God redeems the unlikely, and we live the unexpected. Christianity isn’t about growing “good” – it’s about growing grace-filled and Christ-like. Blessed assurance, Jesus assures us: You don’t have to pull yourself up by your bootstraps – you only have to pull close. After our long lunch with Ken that day, as his Survival Guide words for the Soul were our feast, my daughter and I wandered down to the ocean. We walked the water’s edge for hours. We watched the beating tides. 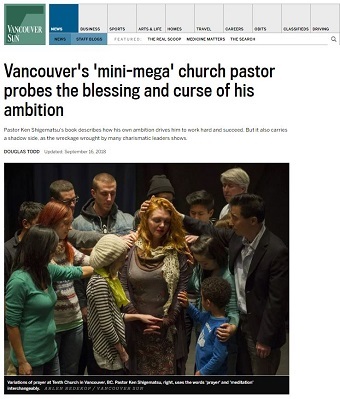 is senior pastor of Tenth Church in Vancouver, one of the largest and most diverse city-center churches in Canada. He draws on both eastern and western perspectives in writing and speaking. Ken’s first book, God in My Everything, was named Christian Living Book of the Year by the Word Guild. I’m Ann Voskamp, a plain Ann without even the fanciful “e”, wife to The Farmer, mama to 7, and honestly, I’m a bit of a mess. It’s okay, really. She has written several books, one of which – One Thousand Gifts: A Dare to Live Fully Right Where You Are – has sold more than a million copies. Go here for more background. 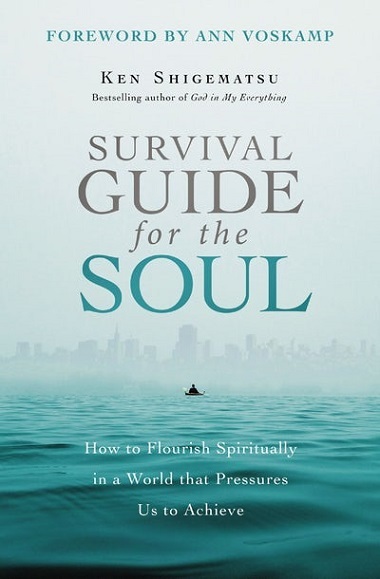 Vancouver Sun columnist Douglas Todd had Vancouver School of Theology professor Jason Byassee write a review of Survival Guide for the Soul September 16. It was very positive, but also astute in its understanding of Ken Shigematsu’s role, both in Vancouver and in the broader picture. As a certain rabbi from Nazareth said, a prophet is not without honour, except in his hometown and among his own people. Ken Shigematsu is the longtime senior pastor of Tenth Church on Tenth Ave. and Ontario, almost the exact geographic heart of Vancouver. He inherited an aging mainline church of around 100 mostly older white folks in the mid-1990s. Now Tenth has some 2,000 in worship in four different worshipping communities in three locations in the city. In an age of seemingly irreversible church decline, Tenth is an outlier for its growth. . . . He is finding his voice, it resounds with confidence, wisdom and kindness. Ken’s book describes the blessing and curse of his own ambition – it drives him to work hard and succeed; it also carries a shadow side, as the wreckage wrought by many charismatic leaders shows. Ken suggests both our “striving” self and our “soulful” self are good gifts, and each need one another. This book has the same gift his sermons have: it feels like he is talking just to you. And you want to live better for having heard him. Go here for the full review. First of all, when A.B. Simpson in 1887 first began what would eventually be called the Christian and Missionary Alliance – it was an interdenominational, ecumenical movement that never intended to actually be a denomination, but an “alliance “of various Christian groups working together with a common mission to proclaim the gospel Christ and further his Kingdom. Ken is not alone as a bridge builder, but he is a very positive influence for anyone who cares about cooperation and unity in the church.